It’s hard to find a device nowadays that doesn’t come equipped with a webcam. It’s pretty much the equivalent of stepping into a car that doesn’t have a CD player in it (not that the CD players are even used as much anymore) . In the business world, webcams are used daily for videoconferencing; in one’s personal life they’re used for nanny-cams, chatting with friends, connecting with family and checking in on one’s home. So, it’s scary to think about the hackers who can quite easily invade your computer and log right in to view life through your webcam. The good news is that gone are the days of using post-it notes to protect yourself. Webcam covers have been selling off the shelves like hotcakes this season. Why? Because when you gift a webcam in any capacity – to a friend, to your team at work, as a thank you gift or as a referral gift – you’re showing the recipient you care about their safety. Webcam covers for home computers, laptops, mobile devices and tablets offer peace of mind. And, when your logo is imprinted on one of these useful devices, the name of your business will literally be viewed hundreds of times per day by all those individuals and companies who value privacy. It really is a win-win! Direct mail isn’t dead! We don’t have to convince you about the effectiveness of direct mail… it has a proven track record. In fact, mailings are one of the most highly-targeted forms of marketing. Did you know, when using promo products as an incentive to respond, you are generating four times as many responses as a sales letter alone? The beauty of webcam covers for this purpose is they’re so lightweight they can fit easily and inexpensively into a letter. Or, consider affixing them to a postcard and creating a campaign around that! One stamp will get your promotion delivered. Go the extra mile to stand out from your competition. 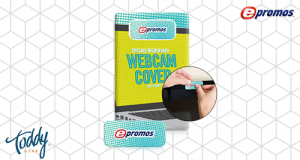 Surprise your customers with a useful gift such as a webcam cover to remind them of how much you value their business. It’s really that simple and will go a long way. Your employees are the number one asset of your company, and in many jobs, they’re at their computers all day. Thank them (and protect them) by giving them a tech-savvy gift. Even better – gift them with two – one to use at their work station, and one to use at home, showing you care about their safety both in and away from work. Mining for new prospects is what trade shows are all about . . . exhibiting gets you face-to-face conversations with buyers. However, before those conversations can take place, you need a great giveaway to draw attendees to your booth. In today’s digital age, people are demanding technology-related items because they are so useful. So, giving away webcam covers (either prior to the event to entice people to your booth, or during the event to stand out from the crowd) makes a ton of sense. The best part – they’re travel-friendly! You can supply an entire tradeshow floor with gifts that were shipped in a small box! Whether your sales staff travels locally, nationally or globally, they are your frontline marketers. They will love the opportunity to provide gifts for the people they are meeting with on every trip. However, fitting gifts inside carry-on luggage is always an issue. These hardworking professionals deserve an “easy button” every now and then. Introduce them to a webcam cover giveaway that’s lightweight and small enough to bring on every trip. Clients will love the trendsetting gift they will truly find beneficial. Core values can help convert prospects in to customers, if conveyed clearly across all marketing touchpoints. A great way to start getting your customers and potential customers familiar with your core values is by demonstrating those values with promotional products. Webcam covers will give customers peace of mind – one of the most powerful things any company can offer. You’ll be keeping your clients safe with a personalized camera cover that will make a big impact. Custom packaging gives you the opportunity to tell your whole story while making a great first impression. Use the space to tie in the “why” and “how” people can benefit when working with you. Custom packaging, which is available on our featured webcam cover, increases the perceived value of a gift, and the likelihood they’ll remember who you are and what you’re about. Are you looking for more ideas on how to use webcam covers to your advantage? Call us, the promo know-how people, for expert tips and tricks. A webcam cover is the simplest and most effective tool to prevent webcam hackers from spying. SpySafe™ webcam covers are unique because they are made of soft microfiber. The soft material allows your laptop to close seamlessly. It will stick to virtually any flat surface including plastic, glass and metal. They cover any camera lens on tablets, cell phones, laptops and computer monitors. They stay in place with a unique adhesive that ensures multi-use and no residue on the screen surface when you remove the webcam cover. ePromos has two types of Toddy Gear® SpySafe™ Webcam Covers. The first is a customizable webcam cover on a backer card with SpySafe product information already on the presentation card. Or, if you want to customize your packaging for more impact (we love this option! ), we suggest the webcam cover with personalized packaging. You can create your own packaging by fully customizing the card with a design created by you! Call us, the Promo Know-How People, to talk through how we can fit in webcam covers into your next promotion.